From d’Orbigny to Audubon to Bell to Roosevelt . . .
How did Theodore Roosevelt develop his interest in birds? The chain of events may surprise you. As a budding birdwatcher, Roosevelt was influenced by John Bell, a New York City taxidermist. It turns out that Bell started watching birds 50 years earlier on a trip up the Missouri River with John James Audubon. 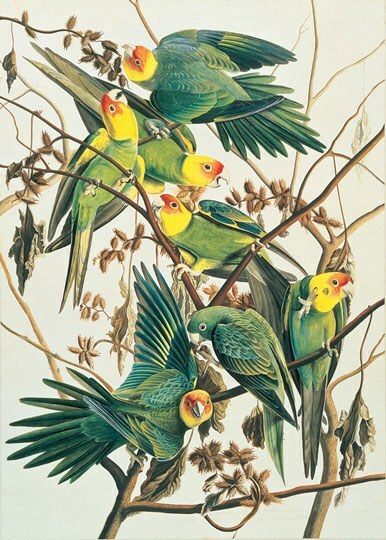 And Audubon’s interest in birds – including these Carolina Parakeets, now extinct – had been piqued in France, at the end of the 18th century, when he met the famous natural historian Charles d’Orbigny. A line, connecting mentor to mentor. Genealogy is all the rage: Who doesn’t want to know more about their ancestors — to hang a new leaf on a tree that bristles with presidents and noblemen and heroes? A line through time, from mentor to mentor. Bird sounds provided by The Macaulay Library of Natural Sounds at the Cornell Lab of Ornithology, Ithaca, New York. Music: Mahler Symphony No 9 in D, Chicago Symphony Orchestra conducted by Pierre Boulez; Beethoven Symphony No 9 in D Minor, Chicago Symphony Orchestra conducted by Sir George Solti. Teddy Roosevelt ... the conservation president!